Adam Scott’s return to The Good Place is the big shocker from the end of the season premiere, and he continues to show why he’s one of The Bad Place’s top demons here: Torturing the members of “The Brainy Bunch” (a nickname of his own devising, naturally) with his unbridled enthusiasm and love of past-its-expiration-date internet culture, all in the hopes of driving them apart (and toward eternal damnation). What Jason tries to order at the “Your Favorite Meal” dinner at The Good Plates, and what Janet suggests as an appetizer while posing as a server at The Cowboy Skyscraper Buffet. Their love is real and transcends the surly bonds of the afterlife. Trevor is well acquainted with the oeuvre of Logan Paul and The Slimeball’s Guide To Unsolicited Opinions. He’s now dropped this one on Eleanor and Janet, and if The Judge hadn’t dropped him off the bridge, she might’ve been told to smile more, too. Bonus points for this cigar-store Indian, who’s been given not one, but two classic “cool American” (not to be confused with the overseas branding for Cool Ranch Doritos) signifiers: A pair of shades and a saxophone. This week’s big showcase for the visual effects team: The giant pile of everything Janet attempted to conjure on Earth, a game of Jenga that includes the things she fails to conjure in front of Michael—“dictionary, spaghetti, Jet Ski, giraffe, steamroller”—one of which is a callback-within-a-callback, given the number of times giraffes have come up on the show. (The writing on the steamroller may appear to be some sort of cryptic sports-stat reference, but alas: BOMAG is merely a German manufacturer of heavy machinery.) There’s also a turtle, a plate of nachos (for someone at the Cowboy Skyscraper, though I’m sure they might whet The Judge’s appetite, too), some lethal weapons that include shopping carts, and a big sign that reads “Trevor stinks!—Janet.” in the same typeface as the “Welcome! Everything is fine.”/“Welcome! Everything is great!” walls. Thinking that magnetic resonance imaging utilizes ionizing radiation and not, as it says in the name, magnets, Jason plans to bring an arachnid with him into the MRI machine, presumably in hopes of receiving a radioactive spider bite that would give him the approximate strength, agility, and reflexes of a spider. Instead, he’s gained the Ms. Marvel-like ability to embiggen his hand. As part of his eerily convincing ugly American routine, Trevor rolls a pair of Paul Hogan quotes into one: The “That’s not a knife” setup from Crocodile Dundee, and the future Dumb And Dumber joke that capped off Hogan’s ads for Tourism Australia in the 1980s. “Optimus, Bumblebee, Jazz, Megatron—that’s what you can each call me, now we need nicknames for you guys.” Some classic Good Place misdirection-as-joke-writing, courtesy of the Transformers franchise. It’s just a good thing that he didn’t give Eleanor Jazz. 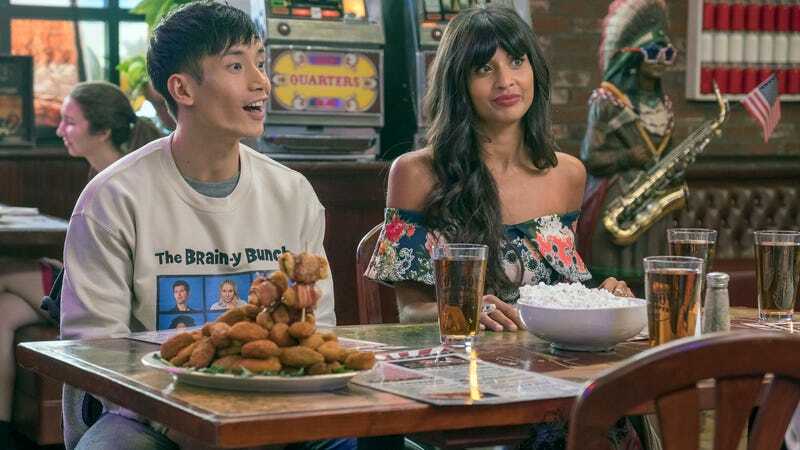 The world of The Good Place has some distinct differences from our own—the existence of Lonely Gal Margarita Mix For One, but also concrete proof of life after death—but this week’s episode acknowledges some explicit parallels: England leaving the European Union, the box-office success of The Greatest Showman, and Byron Allen’s Entertainment Studios (which, c’mon man: Did Jason Mendoza name your production house?) buying the Weather Channel, all consequences of Michael and Janet waving their butterfly wings around on earth. Of course, only one of these really manages to shock Michael: Jason’s beloved Jacksonville Jaguars have reversed their fortunes, and experts are debating whether or not Blake Bortles is a good quarterback. This is something I’m curious about, too: If the immortal beings lose their powers after they’ve beamed down to Earth, does that mean they lose their immortality while they’re there, too? And, if so, are they accumulating their own scores that will then determine whether they go to The Good Place or The Bad Place after they’ve died? When The Judge flings Trevor off that bridge, did she send him into retirement?